Alright now, I've been promising this for ages but here it is! A few tips on where to go when you're visiting Amsterdam. It's not complete yet so I guess I'll be updating this post from time to time. 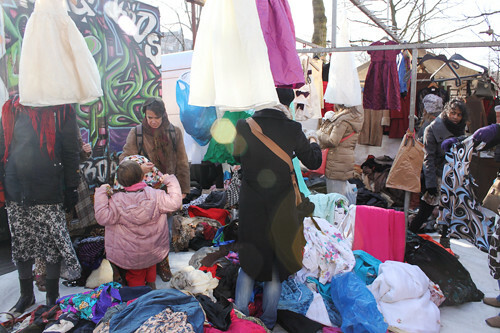 The best tip I can give you is to go to the IJ-Hallen market. 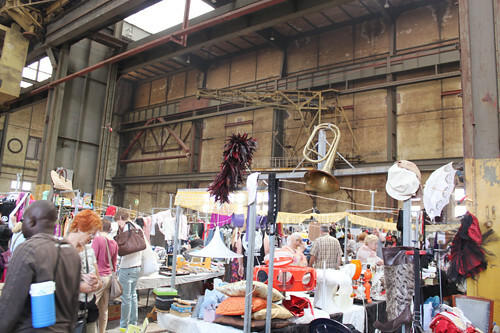 Every first saturday and sunday of the month there is a huge fleamarket (about 500-700 stalls) at the NDSM-docks. It's brilliant. Anyone can sell there so you never know what gems you'll find. 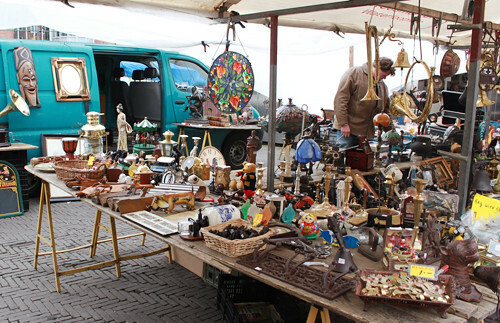 Another good tip is to go to Noordermarkt on mondaymornings. 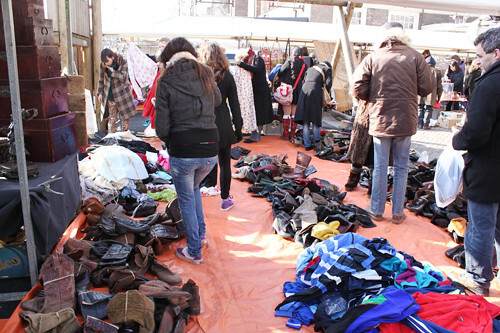 It's not far from the central station and it's a big market with lots of cheap vintage clothes. 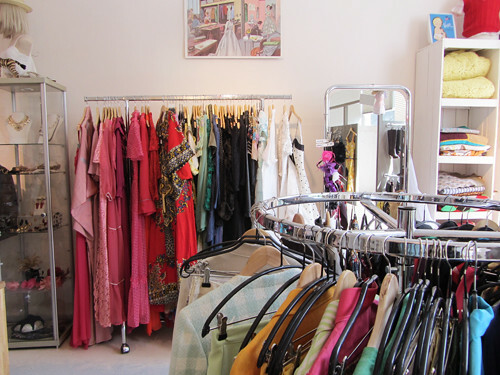 Average prices for dresses vary from about 5€ to 20€ depending on the seller. 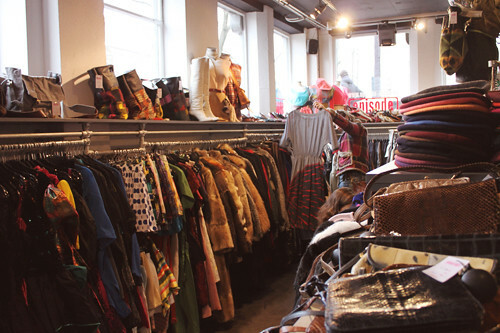 There are giant heaps of clothes that you have to dig through, but you can find some amazing stuff here. Make sure you get there early! Around 9:00 is a good time. 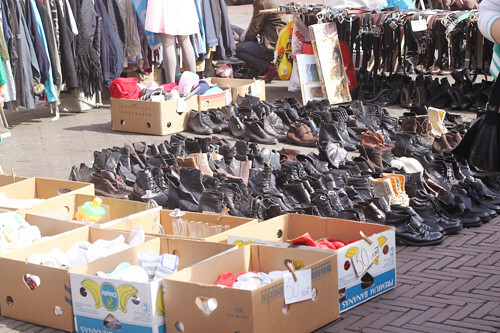 Waterlooplein has a market from 9.00 to 17.00 every day except Sunday. 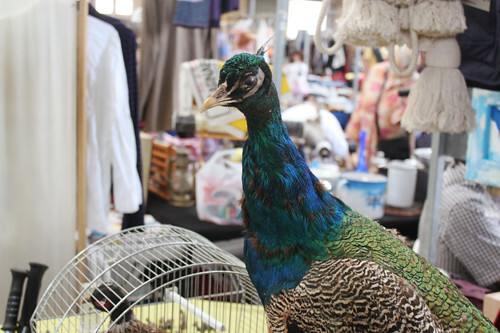 It's part vintage clothes and shoes, but it also has secondhand paintings, camera's, books, bikes, instruments, furniture, kitschy stuff etc, and there are some stalls that sell new products. On Wolvenstraat you'll find a shop called Laura Dols. They sell mostly evening wear, wedding dresses, purses, hats, shoes and other pretty luxury accessories. Sequins, lace, tulle & glitter heaven. Episode has two locations, one at Berenstraat and one at Waterlooplein. I don't really love shopping here cause they're generally a bit overpriced because they select their items by what's on trend right now and the clothing is often altered. Dresses go from about 25€ to 45€. It's hard to find real gems here but it can never hurt to have a look! 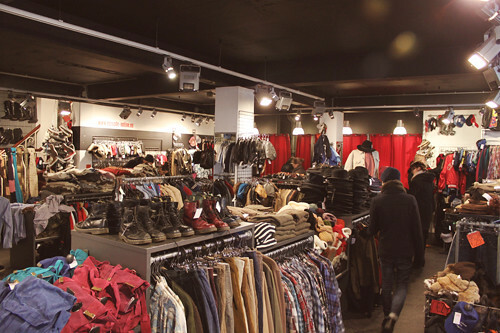 The same goes for Zipper, which has two locations: one at Huidenstraat and one at Nieuwe Hoogstraat (near Waterlooplein). 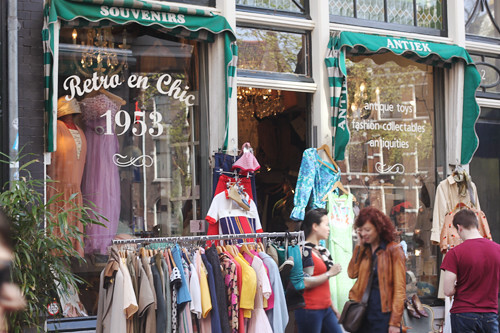 In the area around Waterlooplein (Jodenbreestraat and the beginning of Nieuwe Hoogstraat) you will find some more little vintage shops. 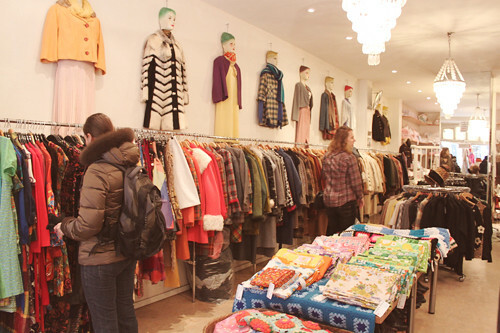 Also near Waterlooplein, at Staalstraat, you'll find Retro en Chic 1953. Love the style of this shop. 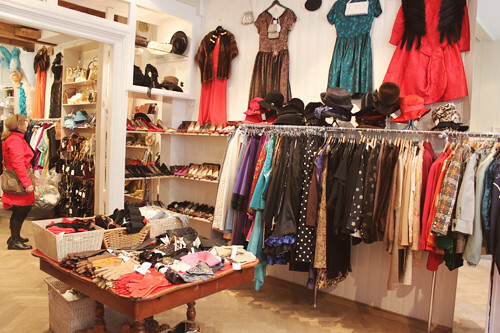 Located at the beginning of Haarlemmerstraat (near the central station) there's a vintage boutique called Wini. They have some pretty dresses and jewelry. The rest of Haarlemmerstraat is also worth checking out, there are a lot of little boutiques with cool unique stuff, like Restored, a shop that sells a lot of things from independent designers. Anything from jewelry, clothing and things for your home. 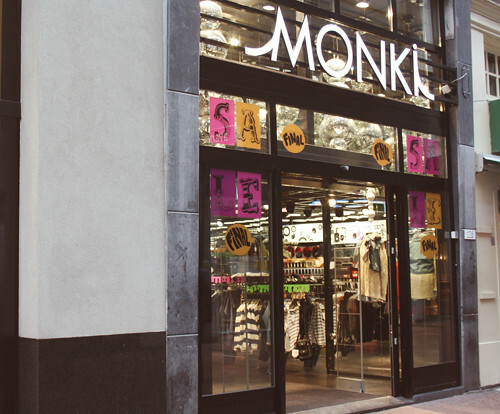 Kalverstraat is usually a street you want to avoid, but Swedish chain Monki opened up a store there that's worth checking out. Other than that you'll find Zara, River Island and about half a dozen H&M's on this street. Wok To Walk. "I'll have the rice with tofu and curry-coconutsauce" is among my most-used phrases. Starting from 5€ you get a lovely orange box full of stir-fried goodness. Several locations. Maoz. Chain of falafel-restaurants. You get falafel in a pita and you can choose from a wide variety of sauces and salads to add (and add and add some more) to that. Several locations. Hardrock Café. Daniel and I go here all the time. Cheap, cheerful, friendly staff, cool music, free refills on soda, best fries in the world and good vegetarian options (you can replace the meat with a veggie patty on any burger). Located near Leidseplein. You nearly always have to wait for a table, anywhere from 10 minutes to a whopping 1,5 hour, but you get one of those pagers so you can hang around town while you wait. Coffee Company is kind of our Starbucks, a cozy hipster hangout and they make a good soy latte and they play nice music. I am so. jealous. of where you live. this sounds amazing! Zo'n leuke post! Lang geleden dat ik nog eens naar de Noordermarkt ben geweest, echt fijn daar. Bedankt! Ah maar I Love Vintage vind ik echt héél duur. Maar ze hebben er wel mooie dingen. Wow, it honestly looks amazing! 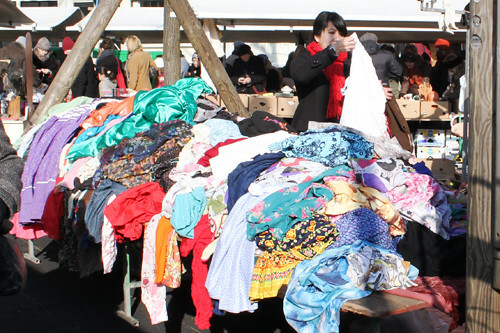 (Especially the pile of vintage clothing at the market!) I can't wait to get over there! Incredible! I wish we had markets and stores like that in New Zealand but we just don't, it's not quite the same. You're so lucky. 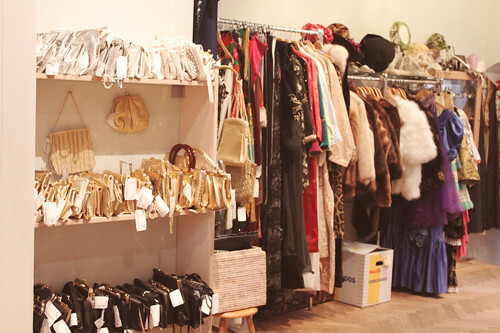 and indeed that are the most prettiest vintage stores of Amsterdam!! that camera stall looks AMAZING! Thanks a lot ! I'm really glad you answered me :) Maybe we will meet one day, trying to find a treasure in a shop ! thank you for this guide, it makes us want to visit this city! ik vind je blog echt leuk! super shopping guide! 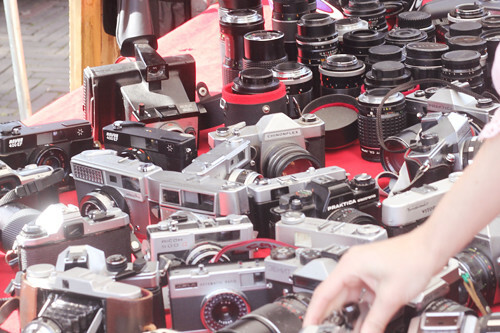 such much market and vintage shopping, I am loving it! wow! this looks like an amazing time!! 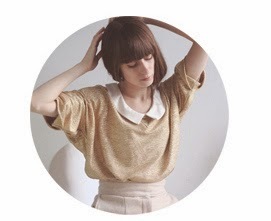 I hope I get to visit Amsterdam some time soon.. :) lovely post, thanks for sharing!